These figures may appreciate King’s citizen-activism and his religious zeal to distinguish right from wrong. But such paeans still sound quite bizarre coming from a Right that is opposing even the slightest attempt at stimulating the economy to help people who need jobs, good schools, and medical care. So it’s worth reminding these notables what King actually thought about the chronic ills of the American economy and how to remedy them. Not content to preach a broad critique, King advocated specific ways to reform the system. In 1963, he argued for “a massive program by the government of special, compensatory measures” to help working people of all races. Only these, he felt, would make possible a class alliance with poor whites who were “confused … by prejudice that they have supported their own oppressors.” In 1965, King told a labor union audience that a huge public works program would do “more to abolish poverty than tax cuts that ultimately benefit the middle class and rich.” It would take guaranteed jobs and income, he believed, to turn the United States into a decent society. Meanwhile, the preacher-activist forged alliances with left-wingers in the labor movement whom he thought were vital to fulfilling his vision. He worked closely with such fellow democratic socialists as Bayard Rustin, A. Philip Randolph, and Michael Harrington and backed their difficult struggle to build a durable bond between the black freedom movement and the AFL-CIO. And King was murdered in Memphis where he had gone to aid black sanitation workers who were striking to win the right to collective bargaining, as well as overtime pay and workmen’s compensation. As in many cities at the time, Memphis officials would have nothing to do with public employee unions. They had defeated previous union drives by firing their leaders. Now, Krauthammer and his ilk may know all this and are simply engaging in a cynical attempt to identify themselves with a national icon. 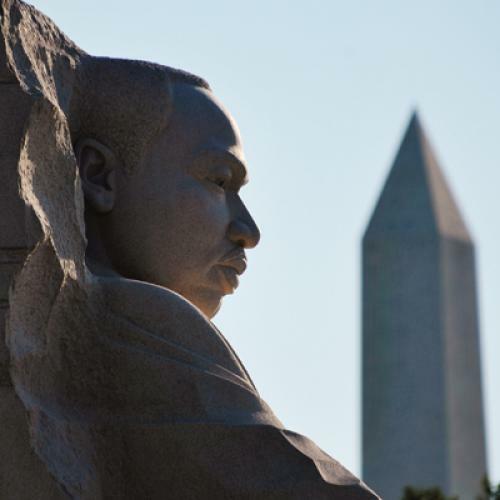 After all, King is the only American honored with a holiday all his own, and excerpts from his oratory are studied in countless elementary and secondary schools and quoted in a myriad of sermons and speeches. In a national survey conducted in 2004–2005, high school students named him the single most famous American who was never president. And his just completed memorial sits between those dedicated to Lincoln and FDR. But before prominent conservatives repeat their praises of the man, they might pause to ask what advice King would give American politicians who have done little or nothing to address the ongoing crisis in the job market and the increase in poverty and wage inequality more generally. They are not going to like the answer. Michael Kazin is the author of the new book, American Dreamers: How the Left Changed a Nation. He is co-editor of Dissent and teaches history at Georgetown University.